Pest control is an effective way to protect public health. 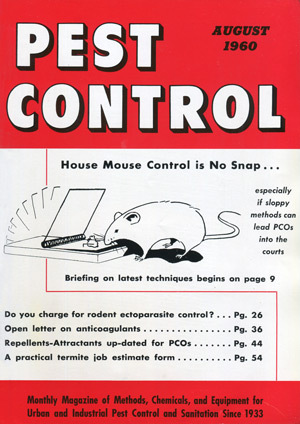 For proof, look no further than an article from the August 1960 issue of Pest Control magazine, as Pest Management Professional was known at the time, which focused on flea- and tick-infested rats. In “Ectoparasite Control: An integral part of every rodent job,” author C.E. Gerhardt of the U.S. Dept. of Health, Education and Welfare Communicable Disease Center in Charlottesville, Va., asked readers, “How much of your work, if any, is directed toward the control of rodent ectoparasites?” To keep clients safe from disease, he noted, the answer should be all of it. In the 1940s, Gerhardt explained, local, state and federal health agencies agreed to allow pest management professional (PMPs) to offer rat control services because of the Oriental rat flea (Xenopsylla cheopis). This rat ectoparasite can be “effectively controlled and the chances for any disease transmission almost entirely eliminated,” he wrote. Because of the risk of diseases from rat ectoparasites, Gerhardt “strongly recommend[s]” PMPs make the control of rat fleas part of their rodent management services, noting: An explanation of this part of the service to the client lets him know that you know your business, and that you are taking extra precaution for health and comfort as far as his establishment is concerned. To successfully control rodent ectoparasites, the author advised a two-pronged approach: apply insecticide to kill the parasites and remove the hosts. If effective, clients will not have a rat flea problem. Gerhardt advised: The rat flea is important. It is the most important of the rat ectoparasites. Include its control in your routine rodent control services. Gerhardt pointed out that ticks are another rat ectoparasite worthy of a PMP’s attention, noting: Ticks are not considered parasites of domestic rats and mice, but are rather associated with our native North American rodents. Ticks are difficult to control; no two situations may be the same. He said control may be needed indoors as well as outdoors: The American public is changing its living habits. Strictly urban areas are being replaced by ‘suburbia’ neighborhoods. Today the fad is country living with its trees, shrubs, woods, weeds, native rodents and family pets. Such proximity to the natural habitat of ticks and their natural hosts is bound to create problems; infestations of the home, infestations of the environment, a transfer of hosts to the family pet, and increased exposure of people to tick bites. He suggested the use of DDT, benzene hexachloride (lindane), dieldrin, chlordane or toxaphene for outdoor tick control. (Editor’s Note: All of these active ingredients have since been banned in the United States for industry use.) For control indoors, Gerhardt advised treating pet beds and surrounding areas. For light infestations, removing ticks from pets by hand offers “satisfactory results,” he said. Gerhardt ended the article on a positive note, with advice that stands to this day: The most important ectoparasite of domestic rats is the Oriental rat flea. Its control is easy and relatively economical. Controlling the rat flea will pay dividends to the public and to [PMPs]. Ticks are important ectoparasites of native rodents. Their control presents both a challenge and an opportunity to the pest control industry.